Egypt's Al Ahly won an eighth African Champions League trophy when they beat Orlando Pirates of South Africa 2-0 in the second leg of the final in Cairo on Sunday. 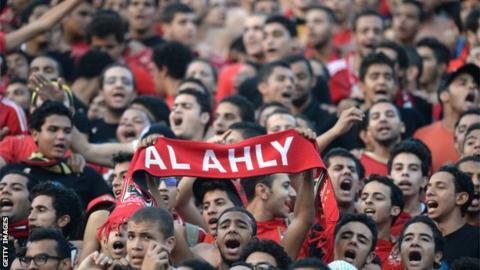 Ahly, who clinched the trophy last year for a seventh time, won 3-1 on aggregate. There were reports of some clashes between hundreds of Ahly supporters and Egypt police before kick-off, with security for the match also under the spotlight. Once the skirmishes were resolved it was the legendary Mohamed Aboutrika who opened the scoring in the 54th minute when he stabbed home from just outside the six-yard box. Ahmed Abdul Zaher doubled the Ahly lead in the 78th minute when unmarked inside the box he shot past the Pirates goalkeeper Senzo Meyiwa. The Egyptian champions were reduced to 10 men six minutes from time when defender Sherif Abdel Fadil was sent off for a foul on Daine Klate. Pirates, champions in 1995, put up a spirited fight but Ahly's second goal seemed to end their hopes inside a packed Arab Contractors Stadium in Cairo. The South African champions created several chances, but could not take them. The best chance of the first half fell to The Buccaneers in the 35th minute when somehow Tlou Segolela failed to convert from inside the six-yard box, after a superb pull back by Klate from the right, with the Ahly goalkeeper well beaten. Pirates failed again in front of goal in the 63rd minute when Lennox Bacela dribbled past goalkeeper Sherif Ekramy, but his final ball flashed across the face of goal after the Ahly shot stopper forced him wide. The Red Devils' of Cairo pick up a prize of 1.5 million dollars as champions. They will also represent Africa at the FIFA Club World Cup in Morocco next month. Police used tear gas to disperse the crowd as they threw rocks and tried to push their way into the stadium, many with no tickets. Following the scuffles outside the stadium, police put up metal bars to organise fans' access to the stands. Security concerns have been raised ahead of the World Cup playoff between Egypt and Ghana in Cairo in just over a week's time.